The big day is right around the corner. Need a little grounding this Thanksgiving? Here’s a selection of Thanksgiving Day classes throughout the DMV that are sure to help you get centered! UP has one class scheduled – all levels vinyasa at 8:30AM. 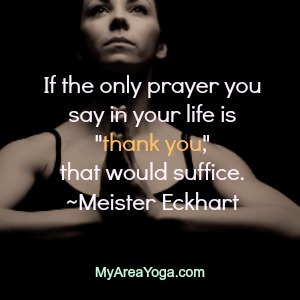 Beloved Yoga is holding a gratitude flow at 9AM. Radiance Yoga is offering two morning classes – one at 9AM and one at 10:30AM. Be Here Now has two classes to suit your holiday schedule – one at 9AM and one at 12PM. Honest Soul Yoga is kicking off Thanksgiving Day with a morning practice at 9:30 in Alexandria. Grace. has one class scheduled for 9:30AM. Embrace Yoga DC is holding a FREE all levels practice at 10:30AM. East Meets West Yoga Center is offering a modified schedule, with a variety of classes being offered throughout the morning. There are so many amazing events coming up in the DMV. Find more on our Events Calendar!